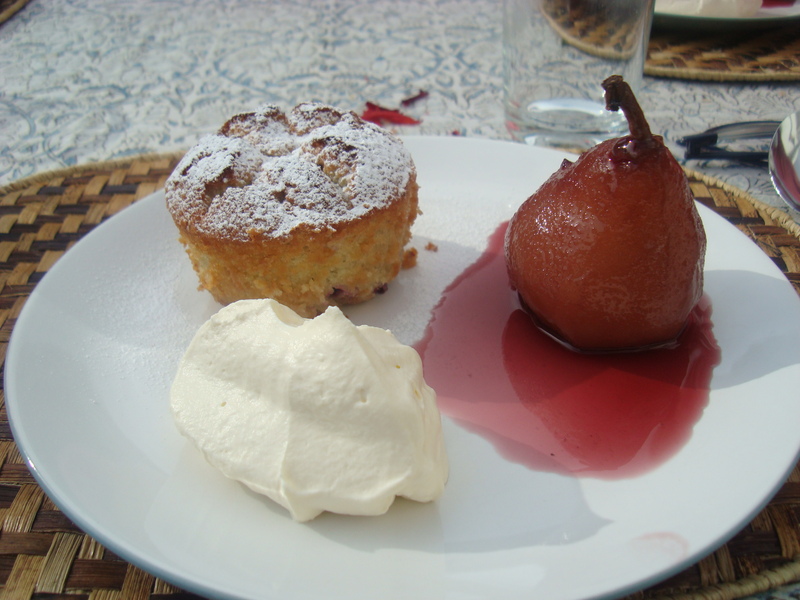 A late middle eastern summer lunch….and a dessert of spiced poached pears & blackcurrant friande. 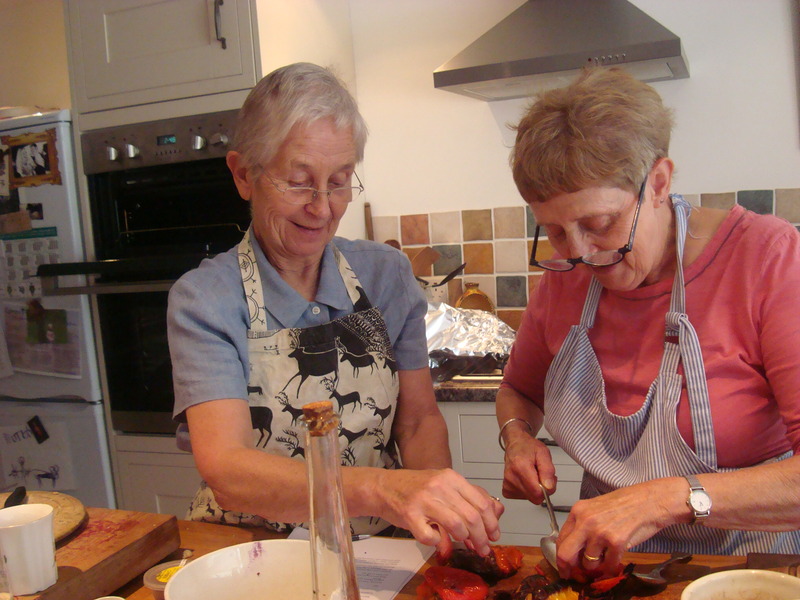 When supper club fans Antonia and Gail asked me to run a middle eastern/Ottolenghi inspired cookery session for their friend Liz’s birthday, the one thing they couldn’t predict was the weather. As we approached the end of September in Wales it appeared winter was well on its way, it was becoming rather damp and grim, but just when I’d pulled out those chunky jumpers from the back of my wardrobe, it all changed. We couldn’t have asked for a more glorious day to cook and what better way to celebrate the beautiful middle eastern/mediterranean theme than lunch served on the sun-baked patio. I rolled up and took over Antonia’s kitchen at about 9.30 unpacking two crates of equipment, fresh local veg and a plethora of exotic spices commonly used by Ottolenghi in his book Plenty. Z’atar, sumac, nigella seeds, cumin, black sesame, white sesame, smoked paprika, star anise, in their packages lay scattered across the table for my four ‘pupils’ to sniff as we discussed their common uses. 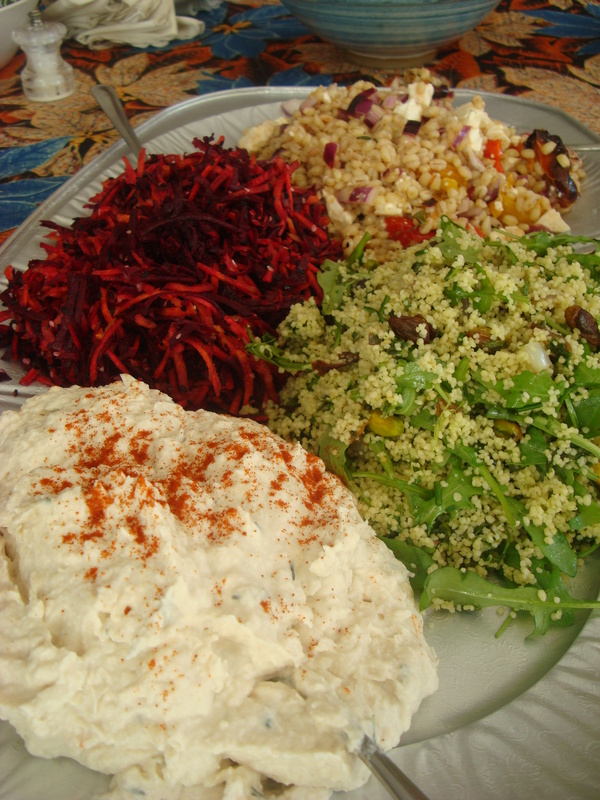 As part of the package I provided printed notes/recipes and working around Antonia’s island we shared the making and preparing of four different salads; a butterbean and rosemary hummus (which has now become my hummus of choice) and carrot and beetroot slaw with nigella and sesame seeds, courtesy of Ellie and Rosie at salad club and a Farro and roasted pepper salad and a green couscous from Ottolenghi’s book Plenty, plus his savoury tart tatin. 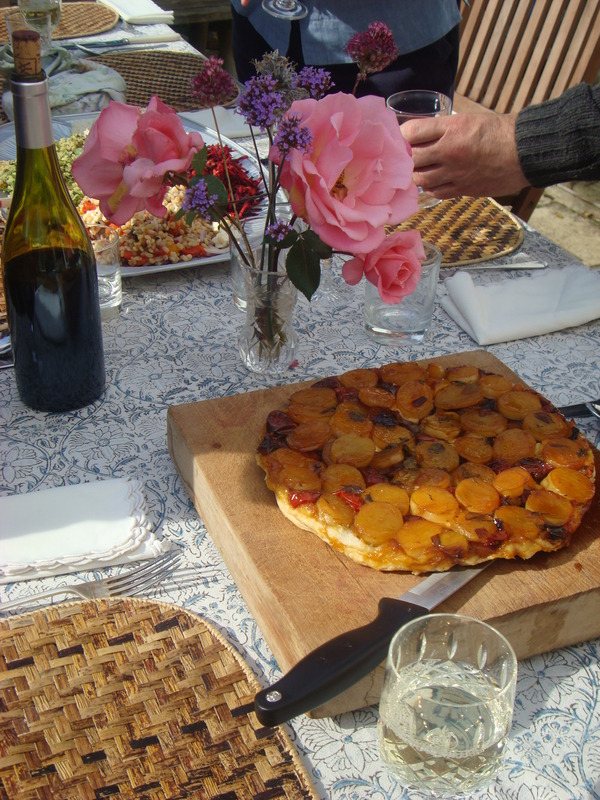 We then made some simple flat bread and a spiced poached pear, blackcurrant friande with amaretto cream all of my own for pudding. assembling the tatin watched by my 'pupils'! 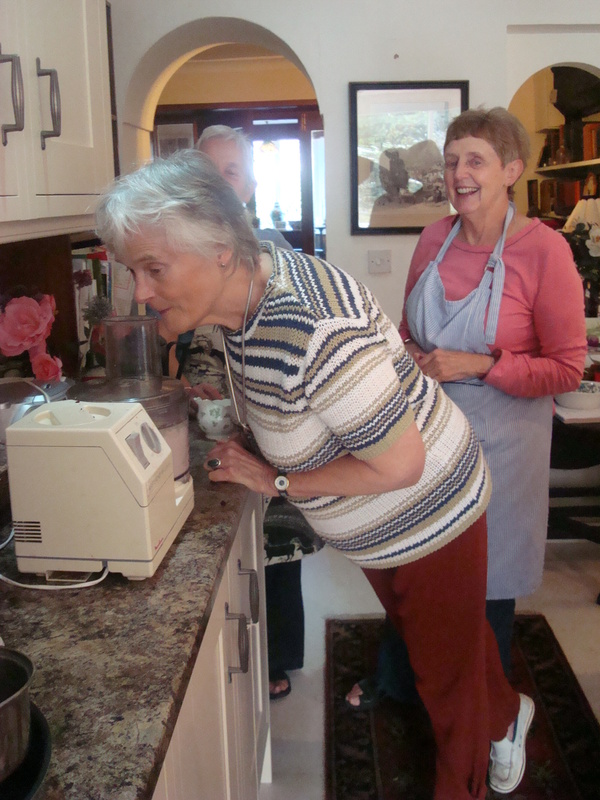 Each lady took responsibility for preparing a salad while I tried not to take over, did a lot of washing up and tried to impart some tricks of the trade. I encouraged everyone to taste as we went along commenting on seasoning and flavourings (does it need anything else? Was my frequent question) something that we often forget to do but is very important. The only demo’s I really did were making a caramel for the top of the tatin and its construction and the sponge for the friande. It was a really communal day with a great sense of achievement at the end. 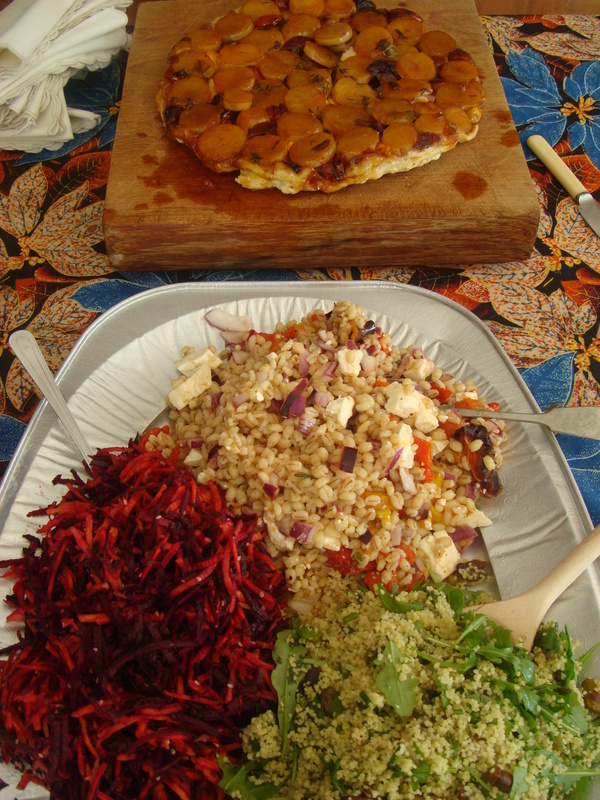 Everything worked beautifully; the salads looked fantastic served Ottolenghi style on a big platter, the colours stunning in the lunchtime sun. 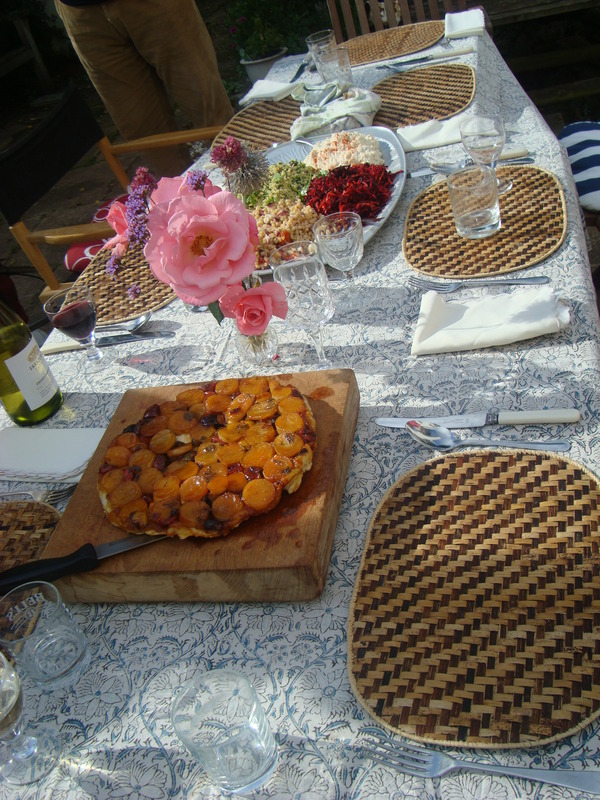 The breads were beautifully speckled and the tatin sweet and rich. Pudding was sublime! 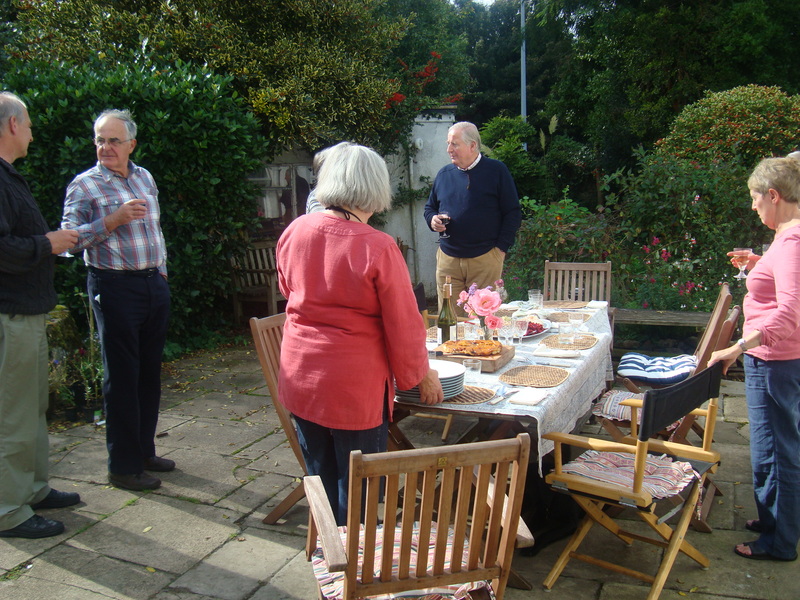 The lunch guests arrived to whom the ladies showed off their fantastic creations and Antonia laid the table in the garden. They wanted me to stay for lunch and of course I wasn’t about to refuse…if only could have drunk more wine, but just as we finished it was time for me to nip round the corner to pick Aidan up from school and head off home in the car. 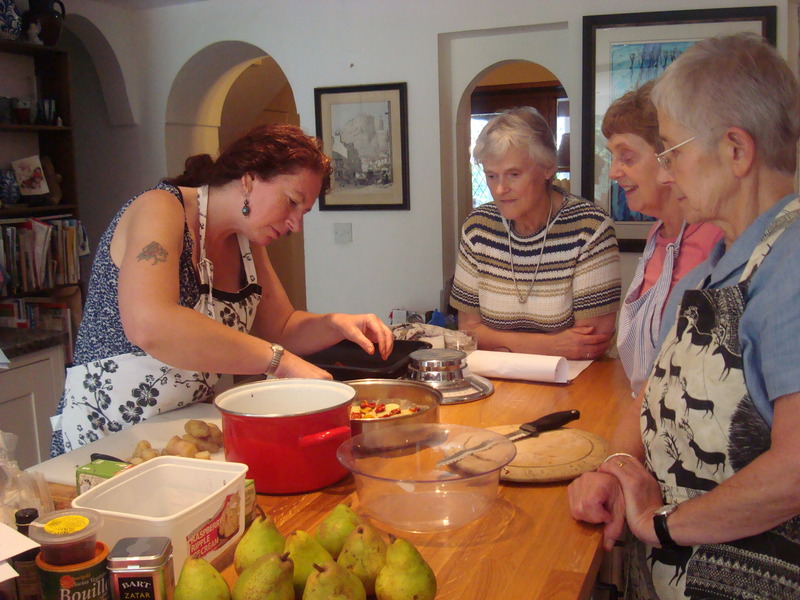 I’m hoping the ladies will have learned a few tips for making quick, easy and striking middle eastern feasts. First; be brave about experimenting with strange ingredients or combinations of spices and then don’t hold back with those spices and seasonings and second, most dishes (even if they seem off-putting because they have lots of ingredients) are actually quite straight forward and totally worth the effort. Personally I am taking notes for the future on how to lead a decadent retirement!! Place the sugar, water, wine and spices in a pan. Heat gently until the sugar has dissolved. Bring to the boil and boil rapidly for 5 minutes. Peel the pears leaving the stalks on and place in the prepared syrup. Cover and simmer gently for 20 to 30 minutes until translucent (or pierced easily by a sharp knife or skewer). Remove from the syrup and place in a serving dish. Boil the syrup hard until reduced by half and syrupy. Spoon over the pears which can be served hot or cold with cream. 3 tbsp black currants or other berries. Grease eight moulds and dust with flour. Melt the butter. 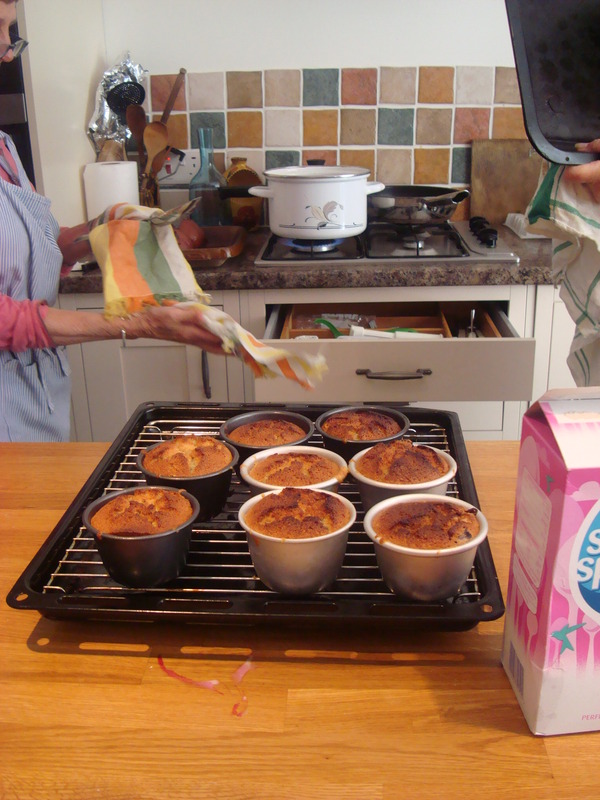 Sift the icing sugar and flour into a bowl and stir in the almonds. Whisk the egg whites to soft peaks then gently fold them into the dry ingredients with a metal spoon and a really light hand. Be careful not to over mix as the air will be lost and the sponges will flop! Add the lemon zest and fold in the melted butter and vanilla essence, still stirring as lightly as possible. Finally, fold in the fruit. Fill the prepared moulds and place the friandes in the oven for around 20 minutes until light, well risen and firm when pressed on top with a finger. Whip the cream with the icing sugar until quite firm then fold in the amaretto. Keep in the fridge until ready to serve so it’s almost like serving ice cream. Totally sinful, but undeniably blissful!